It's almost Independence day!!! As a proud American, I adore this holiday. As a history nerd, I love the surrounding history of it. As a basic white girl, I love picking out a dress to wear for the event. I also love sparklers... and the only appropriate holiday is Independence day. Every 4th of July for the last 5-6 years, we spend the 4th of July at our local country club for a big BBQ, lawn festival, and amazing fireworks. It is such a fun event with so many of our local friends and I look forward to it every summer. Because it is the country club, the dress code is a touch fancier than your average BBQ. Finding a red, white or blue dress that is classy enough the location and cool for the summer heat is always a challenge. I already picked out my dress and I am obsessed with it. I have wanted a simple Gingham dress like this for SO long. My dress is from Target and it was under $30!!! It is such a lovely fit and style for a variety of body types. The fabric is cool and breezy; perfect for hot summer nights. I would say it runs a bit small if anything. I love the slightly full skirt and I just want to twirl and twirl in this dress! I styled this dress two ways: with a belt and high heels for fancier events and no belt and soft leather sandals for less dressy affairs. I love that it can transition and look perfect either way. Here are some other picks I found that would be adorable for any 4th of July event! That's a super cute dress. Perfect for the summer time. 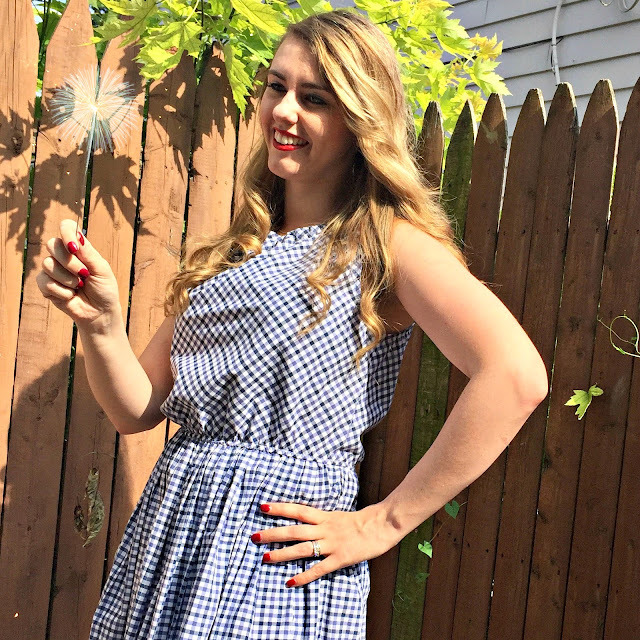 I am ALL about that gingham dress! It is so chic and perfect for the 4th of July!